When the food arrived at our table at Public School 404, I honestly expected it to come on a compartmented cafeteria tray. The schoolhouse-chic vibe permeates the space with as much saturation as a Pinterest board party theme. The California-based micro-chain, which opened its Atlanta iteration (hence the 404) on Howell Mill Road in the Westside, bills itself as "an education in the art of food and beer." And much more than its fish camp-themed neighbor, the Optimist, PS 404 takes the scholastic theme up to an 11. Letterman jackets on hooks greet you as you enter the spacious gastropub. Windows are lined with geography class globes. Dividers between tables are topped with microscopes, books and jars of pencils. Near free-floating round booths are lab-like tables with cushioned stools. There are flash cards above the long bar and hexagon ceiling tiles mimicking illustrations of molecules. Warm woods begin to resemble old-school gymnasium floors just because you expect it. For those playing hooky from the table, there are darts and giant versions of Connect Four and Jenga. No value assignedThe open kitchen wrapped in glass takes up a large corner, its marble counters stacked with plateware. Then the menu arrives, fashioned to look like a composition book. Waters are placed on bev naps that appear to be notebook paper. At Saturday brunch, mimosas and breakfast burritos came scripted onto a Scantron testing sheet. No value assignedNot many places in Atlanta make tater tots in house. Here they are part of the "For the Table" section of the menu. They are on the large side, fried golden, oozing with cheese, and stuffed with crispy bits of bacon ($7). Buffalo cauliflower ($7) is like a vegetarian version of wings crispy, a little spicy, and served with bleu cheese for dipping. 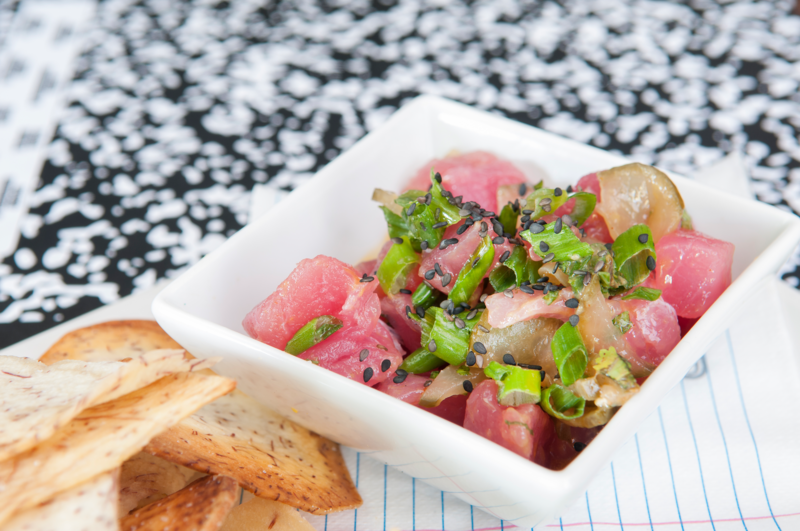 Another standout is the ahi tuna poke ($11): as pretty as it is flavorful with small cubes of fish tossed in a fruity-plus-umami passion fruit ponzu with pickled cucumber, green onion and thin crisps of freckled taro chips. Sandwiches are de riguer for lunch at school and PS 404 has a sundry assortment. A handful of burgers and a crispy chicken sandwich come with your choice of sides: average fries, bright poblano carrot slaw, or flavorful red quinoa. The Hot Mess ($13) is a comforting combo of smoked turkey, melted tangy Grafton cheddar, caramelized strands of onion, and pickled jalapenos on a thin grilled bun with a bowl of French onion soup-like au jus. Adobo skirt steak tacos ($11) are colorfully packed with tender hunks of seared and full-flavored meat, cool avocado salsa, pickled red onion, cilantro and a sprinkling of queso fresca. No value assignedFish and chips ($16) arrive on a speckled robin's egg blue Steelite plate. Three hefty portions of beer battered cod, the flesh flaky and steaming, tasted of summertime fish frys fresh and light but also satisfying. Clever mishmashes abound. A noodle salad ($14) combines cold soba noodles, pulled chicken, shrimp, cucumber, mango, mint, cilantro and Marcona almond slivers with a spicy chili vinaigrette. A stack of thick grilled watermelon slices, heirloom tomatoes, and feta cheese comes drizzled in olive oil and balsamic with bits of almond. It's both refreshing and filling ($10). Something you never had in the school cafeteria? Sixteen beer taps half of them pouring local brews. The menu gives annotated notes on flavor and hops; servers know the brews well and which menu items pair with them. The bar is well-stocked, including bottles of local ASW Fiddler bourbon, and cocktails embrace classics with simple riffs. New School Penicillin is lovely and balanced, subbing bourbon for Scotch and adding ginger, honey, lemon and barely a dash of Laphroaig. No value assignedWhen it's time for dessert, there isn't a bad choice. The Nutella cookie sandwich with vanilla ice cream pressed between two chocolate chunk cookies is rolled in pecan bacon brittle, adding salty balance to the sweetness. While PS 404's theme is pervasive, it ends when it should. No one is wearing private school uniforms or dressed like a coach. Instead, servers bring professionalism and attention to detail, and the food while not reinventing the wheel is better than the average pub grub. Overall, the restaurant is a welcome addition to the Westside and a fun place to indulge in a bit of school days nostalgia over beers after work. It's kinda like recess, for grown-ups. Public School 404. 930 Howell Mill Rd. 404-817-0984. www.psontap.com/locations/ps404.